Includes lessons, scripts, and quizzes. A full course outline can be found here. A free lesson can be tried here. $79 for a full year subscription. Includes lessons, scripts, reviews and quizzes. A full course outline can be found here. A free lesson can be tried here. $39 for a full year subscription. Available for $10 when purchased in combination packages below. This course is a perfect introduction to intramolecular bonding. It is useful for students taking biology when they have not had chemistry, as well as students who have minimal science backgrounds and are starting chemistry. It is also an excellent standalone course for middle school students or high school students if they are not quite ready for a full Chemistry course, but want to get a head start. When purchased with other courses, it is available for $10. See the combination packages below. 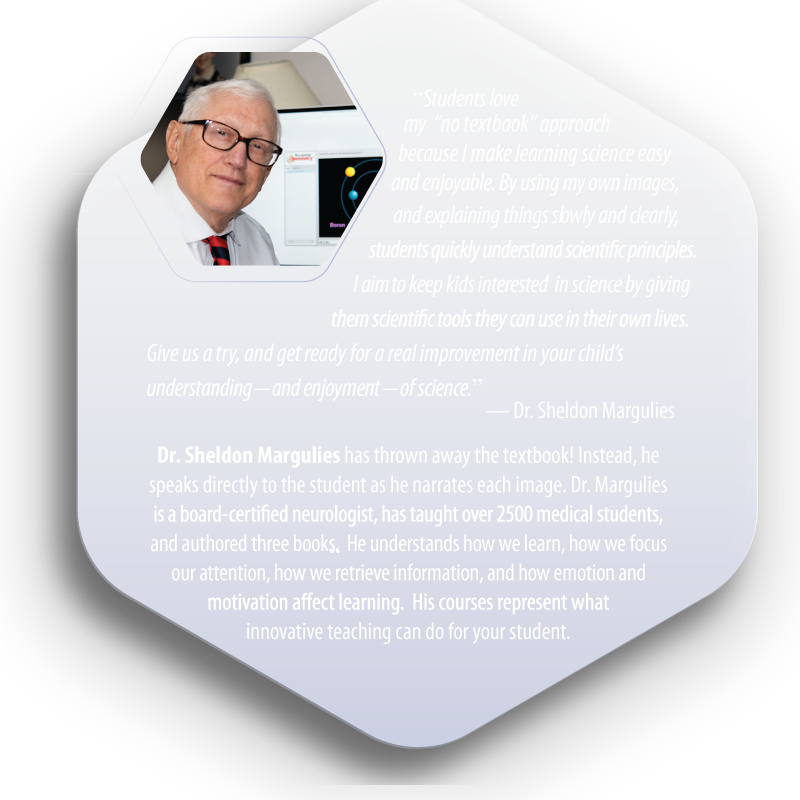 Includes lessons, scripts, quizzes, and 10 labs. A full course outline can be found here. A free lesson can be tried here. $79 for a full year subscription. Includes lessons and scripts. A full course outline can be found here. A free lesson can be tried here. $39 for a full year subscription. Includes lessons and scripts. A full course outline can be found here. A free lesson can be tried here. $20 for a full year subscription. Combination – Includes lessons and scripts. Fascinating Medicine consists of two courses: Fascinating Anatomy & Physiology and The Logic of Medicine. $49 for a full year subscription. Both courses. $125 for a full year subscription. All three courses. $135 for a full year subscription. All three courses. $125 for a full year subscription. All three courses. $175 for 2 full years subscription. All four courses. $185 for 2 full years subscription. We purchased the Chemistry course for my 16-yr-old daughter, who is a visual learner. Although she is stronger in language than math/science, she really likes the program! The succinct explanations combined with the slides help her understand AND remember the material covered. We will definitely continue to use this program and look forward to my younger son trying it out next year! My 14 year old son is both gifted and dyslexic. He is extremely interested in science. I have searched for years for a good audiovisual science program for him. I was so happy to find yours. I am not sure if you are actively marketing the product to dyslexics and other folks with print disabilities or not. I think you would do very well within that market. It is hard to find anything. That being said, I do think it is helpful to have the print version to follow along with and love that y’all post it on the site.